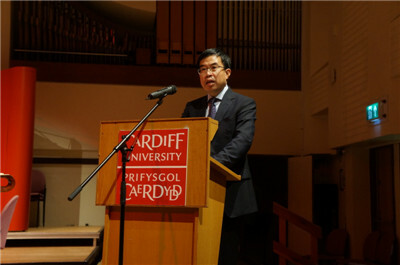 On October 15, at the invitation of the Welsh government, Minister Counsellor Yang Xiaokun went to Cardiff to attend and address the Welsh Chinese Mid-Autumn Festival Celebration 2018 at the Concert Hall of Cardiff University. Over 100 guests attended and watched the performance, including the Rt Hon. 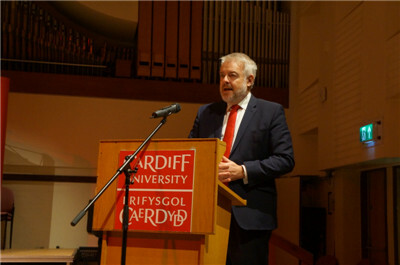 Carwyn Jones AM, the First Minister of Wales and Professor Damian Walford Davies, Pro Vice-Chancellor of Cardiff University. 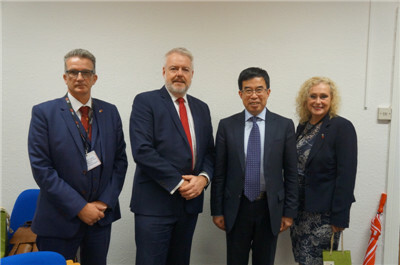 Minister Jones said that with the deepening of cooperation and exchanges between China and Wales, more Chinese students and scholars have come to Wales to study or do research, which has enriched the diversity of local culture. The three Confucius institutes in Wales have made outstanding contribution to teaching Chinese and spreading Chinese cultures. After the Brexit, China-Wales relations will become more important. Wales will be more active in conducting exchanges and cooperation with China. On the evening, Chinese National Orchestra of Shandong University, Cardiff University School of Music and the Confucius Classroom of Ysgol Gyfun Cwn Rhymni presented in Chinese, English and Welsh an excellent performance combining Chinese and Western elements. Before the performance, Yang and Jones exchanged views on China-UK relations and cooperation between China and Wales. Ifona Deeley, Head of International Relations of Welsh Government, and Stuart Lyden, Geographic Lead Officer of China & Africa at Welsh Government were present.